Our glass transition training courses in Toronto, ON cover a variety of key components. 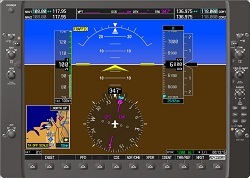 When a rectangular computer display replaces a familiar grouping of flight instruments and data presentation varies greatly from an analog format, pilots might feel uncomfortable and lost when they are expected to control a panel that they have little to no experience with. If you are a pilot and are switching to a glass environment, we are here to help you make this transition easier with our glass transition training courses at Genesis Flight College. Sensors—These sensors help you identify failure modes and understand the impact of these failures. Power sources—You will learn how the control panel receives and uses power when the aircraft is in use. Standby systems—The best standby systems are designed to resemble the main systems they back up. Programming—You will become familiar with a variety of programming systems, including those that control moving map displays, alternate screens for weather and traffic, and more. Every glass transition training course we provide begins with a VFR cross-country simulation. At this time, you will learn how to program pilot references, as well as basic navigation features. We will also teach you how to effectively configure different screens, so you are able to view the information that is most important to you without excessive knob turning. If you would like to find out more about glass transition training and what it entails, reach out to us at Genesis Flight College. We would be more than happy to answer your questions. At Genesis Flight College, our glass transition training program is available to residents of Toronto, Collingwood, Barrie, Aurora, Brampton, Caledon, Markham, Newmarket, Richmond Hill, and Vaughn, Ontario.